Regular readers of Universe Today will be well-acquainted with the photography and timelapse work of Randy Halverson. He’s just released his latest timelapse and in a word, it is breathtaking. Aurora, thunderstorms — sometimes both at once — and, of course, stunning views of the night sky. Sit back, put this on full screen and full sound and take a well-deserved break from your day! Thanks once more to Randy Halverson for continuing to share his handiwork! Find out more about this timelapse at Randy’s website, Dakotalapse. Huelux from Randy Halverson on Vimeo. Assembled from actual photographs taken by astronauts aboard the Space Station, many of them by Don Pettit during Expedition 31 (Don took a lot of photos) this timelapse “The World Outside My Window” by David Peterson ramps up the artistic value by featuring super-duper high definition, smoothed frame transitions and a musical score by “Two Steps From Hell.” (Don’t worry, that sounds scarier than it is.) Even if you’ve seen some of these clips before, they’re worth another go. After all, there’s no good reason not to be reminded of how beautiful our planet is from space. Enjoy! *It’s actually two minutes and twenty-eight seconds but I don’t think you’ll mind. These nights the aurora “really lit up,” said Malone. And there could be more aurora coming soon to the northern skies: SpaceWeather.com is reporting that a coronal mass ejection propelled toward Earth by an M1-class eruption on October 13th is expected to hit our planet’s magnetic field on October. 15th. “Polar geomagnetic storms and high-latitude auroras are possible when the CME arrives,” says SpaceWeather. Of course, not all aurora actually look like this to the human eye — you can read our article from earlier today about the reality of seeing aurorae with your eyes vs. a camera. RADIANCE from LakeSuperiorPhoto on Vimeo. Need a little inspiration to go out and do some stargazing this weekend? Look no further than this gorgeous timelapse by Jack Fusco. There are awesome views of both sea and sky, the Milky Way, star trails, awesome cloud scenes and funky, directionally-challenged moving lights in the sky. Jack said he’s been working on this one for 10 months, and it’s definitely worth the hard work he’s put in. Check out more of Jack’s work on his website and Facebook. Intrigued by mysterious noctilucent, or night-shining clouds? This beautiful new film from TWAN (The World At Night) photographer P-M Hedén combines timelapse and real-time footage to provide a stunning compilation of his month in the field in Sweden this summer to capture these lovely blue electric clouds. Noctilucent clouds are visible sometimes low in the northern sky during morning and evening twilight, usually through late May through August, and they seem to be increasing the past few years. Enjoy the stunning, tranquil views (lots of wildlife and night sky imagery too!) and lovely music in this new film, just published yesterday. For more information about NLCs, Bob King wrote a great overview for us earlier this year about these “visitors from the Twilight Zone! Noctilucent clouds 2013 The Film from P-M Hedén on Vimeo. Astrophotographer Cory Schmitz braved a brown bear in order to capture some wonderful images of the full Moon rise on July 22, 2013. 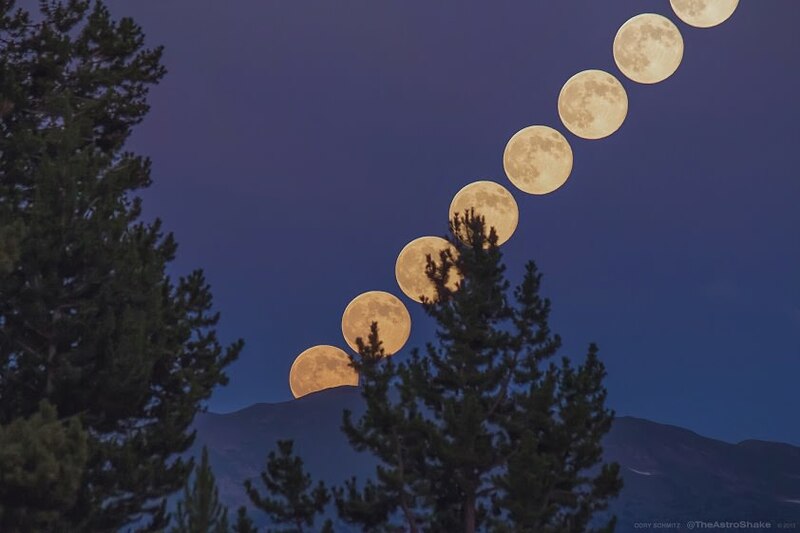 This composite shows a series of images of the moonrise, and below is a beautiful timelapse. A bear sits right on the spot where Cory Schmitz wanted to set up his photography equipment. Image courtesy Cory Schmitz. The full-moon illuminated landcape, overlooking Interstate 70, near Vail, Colorado. Credit and copyright: Cory Schmitz. Have you ever dreamed of camping out under the dark skies of Death Valley? Dream no more: you can enjoy this virtual experience thanks to Gavin Heffernan and his Sunchaser Pictures crew. This magnificent new timelapse video includes some insane star trails, the beautiful Milky Way, and an incredible pink desert aurora! A pink aurora seen in Death Valley. Credit and copyright: Gavin Heffernan/Sunchaser Pictures. See their original Death Valley Dreamlapse here, as well as a behind the scenes “making of” video for this second Death Valley Dreamlapse. Sunchaser Pictures also has a new Facebook page, so “like” them! Star trails timelapse over Death Valley. Credit and copyright: Gavin Heffernan/Sunchaser Pictures. DEATH VALLEY DREAMLAPSE 2 from Sunchaser Pictures on Vimeo. Here’s yet another gorgeous timelapse from Gavin Heffernan and his team. As we previewed in our Geminid Meteor Shower post, the Sunchaser Pictures team trekked to the world-famous Eureka Dunes in Death Valley National Park to search for some of the darkest skies on Earth during the meteor shower peak on the night of December 13th, 2012. They braved a long journey, a tough climb cold temperatures. “But it was all worth it when the skies cleared and showed us an incredible galactic palette!” Gavin writes on Vimeo. In addition to Geminids, there are star trails, planets and a weird spiraling object at about 1:30-1:35. It makes three broad circular sweeps over the desert – although in timelapse it appears to be moving fast, but the 5 seconds of time in timelapse equals about 50 minutes, so it’s actually not moving all that fast. It can also be seen cutting through the circular star trails picture below. There’s another 25-second exposure that of the object moving that makes it look almost like a colored rope. Star trails from 'Death Valley Dreamlapse. A 25 second exposure of an object flying through the field of view. Credit: Gavin Heffernan/Sunchaser Pictures.